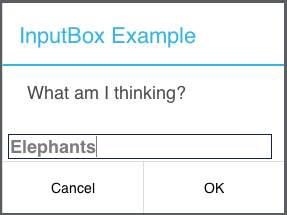 NSB.InputBox presents a modal dialog which prompts the user for an input value. While it is displayed, no other actions may be taken by the user. Unlike InputBox, this function does not halt the program: execution of the next statement will continue immediately. It will not wait for the user’s input. The advantage of this function is that title can be specified. The function argument is the name of a subroutine or function in your program, which will be called when the control is dismissed. The prompt argument is required. It appears under the title. title is optional: if you do not specify one, the Title of the app will show. default is the initial value to show in the input field. When the user clicks on OK or Cancel, function will be called with two parameters: the first one will be either vbOK or vbCancel, and the second one will be the value the user entered. To dimiss an NSB.InputBox from your program instead of waiting for the user, call NSB.closeMsgBox(). This page was last edited on 12 February 2019, at 13:30.